Welcome to the Arts Factory Backpackers Lodge. We invite you to come and relax in our enchanted 5 acre, subtropical haven. 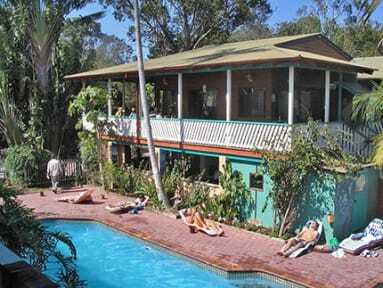 Laze by the pool, swing in the hammocks and soak up the friendly atmosphere for which we are universally famous.birthplace of much of the fame and spirit of Byron Bay and it still maintains that original spirit today. Don't miss the experience of a lifetime! Come stay with us ...relax, rejuvenate, recycle! We do not take bookings for schoolies directly, please contact us through email. For groups of 10 pax or more please contact us through email. Nah it was Pretty Banging. It was my first ever Hostel I’ve ever stayed in and I slipped right into the crowds. Just sling out a deck of cards and make friends with your roommates and you’ll be set. Location is pretty good too, secluded yet close to Byron Bay. Too good!! Julia was the beez kneez!!!! Great atmosphere, very friendly and helpful staff! However the kitchen was a mess from 6pm, and there was very limited crockery! There was only thin sheets but it was really cold in the room. Only on demand we got a bit warmer blankets. I have frozen the whole night. So bring your own sleeping bag with you and it’s fine. Small rooms. A reading light per bunk bed would have been appreciated. Need to improve recycling facilities in kitchen. Otherwise cool, quirky spot. I got off the bus in the centre of town to be told by other hostel shuttle buses that there will be a arts factory bus on its way. I waited 20 minutes for this but there was no sign so contacted the art factory via email but this was ignored. Both the female and male bathrooms had blocked toilets . Then the kitchen was disgusting not enough utensils or hobs and everything was dirty. I would not recommend this hostel. We took the shuttle bus into town and feared for our lives, shocking driving.